Equity Mates: "We were foolishly overconfident investors"
When it comes to investing in the stock market for the first time, three words may well come to mind: terrifying, overwhelming, and intimidating. Terrified by the thought of losing any money? Feel immense pressure to pick the perfect stock? Don’t know where to start? 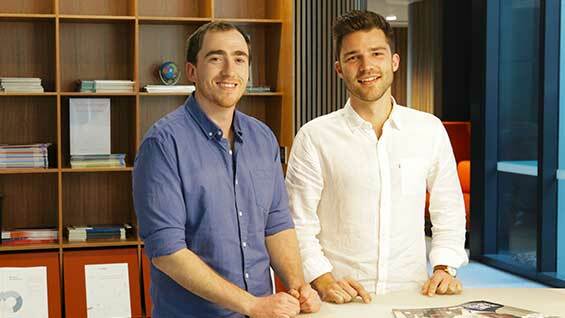 Two friends, Bryce, aged 27, and Alec, aged 25, are hoping to change all that and get more Australians into investing. The pair, who met at university, begun a investing podcast almost two years ago with the aim of breaking down the world of investing, and making it more accessible to everyone. The Equity Mates podcast covers a variety of topics including investing strategies, building a portfolio, risk management, and money markets. They also go back to basics with shows such as 'WTF is an ETF? ', 'Pardon the Jargon' and 'How to Buy Shares'. Growing from a handful of listeners to an audience of thousands, Alec and Bryce have been embraced by the next generation of investors, eager to begin their own investing journey. Morningstar.com.au caught up with Bryce and Alec when they were in Sydney last month to talk about the high and lows of their investing journey and the lessons they’ve learned along the way. BRYCE: I was fortunate enough that my parents put me on the track of investing from a very young age. They me gave 50c a fortnight and by the time I was in year seven I'd saved up $500 bucks. I had no idea what I was doing, but dad helped me purchase my first investment – BKI, a listed investment company. The whole experience got me intrigued in stocks and I would sit down and watch the stock move day to day in the paper. ALEC: My investing journey started a lot later than Bryce's in university when we were living in a share house in Canberra - talking stocks all the time. Bryce's first investment was Brickworks which he still holds today – he's done well. My first investment was law firm Slater + Gordon which I think I've lost almost all my money on. I own so little of the company that I can't sell it because the brokerage cost would be too high. It's just a constant reminder for me. It's was a good learning experience, but I wouldn't recommend it to others. We speak so many people sign up for a brokerage account and then get hit with a wall of numbers and jargon, and give up and leave their money in the bank. I think if you start your journey with LICs or ETFs you don't have to consume yourself with picking the perfect stock. Alec, when you were making that first investment in Slater + Gordon, how did you feel? Were you scared? ALEC: No, I was foolishly overconfident. The stock was on a run. Slater + Gordon were in the midst of acquiring an English professional services firm, it had done a capital raise, it was all over the papers, everyone was talking it up and I was like this is great. It's growing, it's expanding overseas, what could go wrong? All the issues that came out with their balance sheet, the way that they were booking unrealised wins as revenue – I had no idea. You've come into investing in a post-financial crisis era, in a market which some say is the longest bull market in history. You are both heavily in passive ETFs and index funds. Are you at all concerned about a market downturn, and will you stay the course if the market takes a tumble? ALEC: We have a friend who watches the markets and he's been convinced we're going to have a GFC level crash since 2015. He's been out the market for three years, missing returns. Intellectually I know that the right thing to do is stay the course and I hope that I have the temperament to do it. We haven't been tested though. Put it this way; if you had bought into the US market at the peak in 2008, the Friday before Lehman Brothers collapsed, you would have lost almost half your money in six months. But if you held on, you would have almost doubled your money today. We realise there's a lot of other factors to consider, but it's a good lesson in staying the course. But when banks are collapsing, governments are bailing them out, everyone is foreclosing, we know it will be tough. What resources do you use to learn about investing and keep up to date with the markets? BRYCE: I read the financial newspapers and then I go down rabbit holes from there. ALEC: Beginner investing books are valuable. One that I read recently is Millennial Money by Patrick O'Shaughnessy. He does a great job of framing a lot of the basic concepts around building wealth over the long term, not getting too hung up on picking the right stocks, the importance of lowering fees, the effects of compounding. What was the inspiration behind the podcast? ALEC: Bryce and I were both pumping through podcasts through university and we realised there a gap in the market. There were so many good finance podcasts with professional investors or people in the industry talking to other people in the industry, but there wasn't one for people who weren't in the know. We saw an opportunity to provide something that we would have loved when we first started investing, and to formalise our investing journey - and ultimately to hold ourselves accountable. BRYCE: The whole premise of the podcast is break down the world of investing and make it more accessible to everyone. We not financial experts and are not giving financial advice, but we believe we can present investing in a way that makes it less scary. • Investing Basics: small, mid, large cap - does size matter?